The first issue involves wooden studs and the sound they transmit through your room’s framing. Both the floor below the studs, as well as the wallboard attached to it transmit sound through the studs, which are then transmitting vibration to other room areas. If you deaden the studs, you will stop sound from not only being sent to adjacent room areas, but also from travelling up through the ceiling. Using our Resilient Sound Isolation Clips is a very effective method of controlling sound travelling through walls, as well as up through ceilings to stop it from travelling to rooms above. Resilient Sound Isolation Clips provide 2 unique approach's to sound privacy that will prevent sound from noisy neighbors transmitting through your walls or floor/ceiling assemblies. Experience with the Clips has recorded remarkable improvements of up to an additional 20 STC points on walls. The Clips are designed to retrofit and improve existing walls and ceilings has shown to improve existing walls by as much as 8-10 db. by actual field tests. Fasten the Resilient Sound Isolation Clip to the substrate with a fastener approved for a minimum pull-out and sheer of 120 lbs. Ensure the internal metal ferrell is tight to the substrate. • Locate the first row of clips within 3 inches from the floor and within 6 inches from the ceiling. 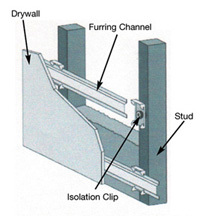 Snap in the drywall furring channel (hat track) into the clips (horizontal for walls). Place 1/4” (minimum) shim on floor to fully support the gypsum board. Install the gypsum board from the bottom up leaving a 1/4” min. gap around perimeter. Caulk around the entire perimeter of the gypsum board. Use fire and smoke rated acoustical sealant. SoundBreak® XP® 5/8"Gypsum Board with Sporgard™* has an acoustically enhanced, high density fire resistant Type X gypsum core encased in a heavy, abrasion and mold / mildew / moisture resistant, 100% recycled, National Gypsum PURPLE™ paper on both sides. Used in the construction of high rated STC wall assemblies, this 5/8" thick gypsum board consists of a layer of viscoelastic damping polymer sandwiched between two pieces of high density mold resistant gypsum board, providing constrained layer damping. SoundBreak XP Gypsum Board is GREENGUARD Children & Schools Certified® for indoor air quality. Another method of dealing with sound vibration picked up by the room’s wallboard is using double drywall with Green Glue in between the layers. Wallboard acts like a microphone, picking up sound vibrations in one room, then transmitting through the attached studs in the framing. The attached wallboard on the other side of the room then “picks up” the sound vibration transmitted through the studs and acts as a loudspeaker, sending the sound vibration into adjacent rooms. Using double drywall with Green Glue applied in between the wallboard on walls and ceilings is highly effective in stopping sound transmission. Green Glue is a liquid, waterborne, viscoelastic damping compound which represents the highest performance product of it's type. We are aware of no product available to the construction market which can deliver damping levels even 30% as high as those offered by Green Glue. It is also significantly lower in applied cost than competitive products, getting a better cost/performance ratio in the damping of normal construction materials such as drywall, wood products, etc. Finally, it is remarkably tolerant to real-world application conditions and carries almost none of the burden of precision required by many damping systems. 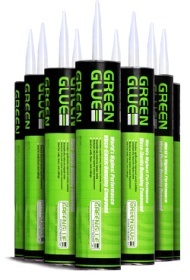 Installation tip: Standard performance requires (2) 29 oz tubes of Green Glue per 4' X 8' sheet or drywall. For enhanced performance use (3) 29 oz tubes per 4' X 8' sheet of drywall. Simply apply product between 2 layers of drywall and mount drywall to existing wall. Apply sealant around the perimeter will also enhance wall assembly.